On Friday, June 2, a vote by the Unified Government Board of Commissioners for Wyandotte County and Kansas City officially amended the city’s existing nondiscrimination ordinance to include protections in housing, employment, and public accommodations on the basis of sexual orientation and gender identity and expression. With the vote, the city and county become only the second and third municipal entities in the state to offer such protections, following the city of Roeland Park in 2015. The move comes as a sharp rebuke to legislation passed at the statehouse in May, which allows both private and publicly-funded adoption agencies to discriminate against LGBTQ people when placing a child, which could result in placement delays for the thousands of children in the state’s adoption and foster care systems. Governor Jeff Colyer signed the bill into law on May 18; a similar bill was passed in the Oklahoma legislature and signed by Governor Mary Fallin in May as well, although similar efforts in Georgia and Colorado were killed in committee. 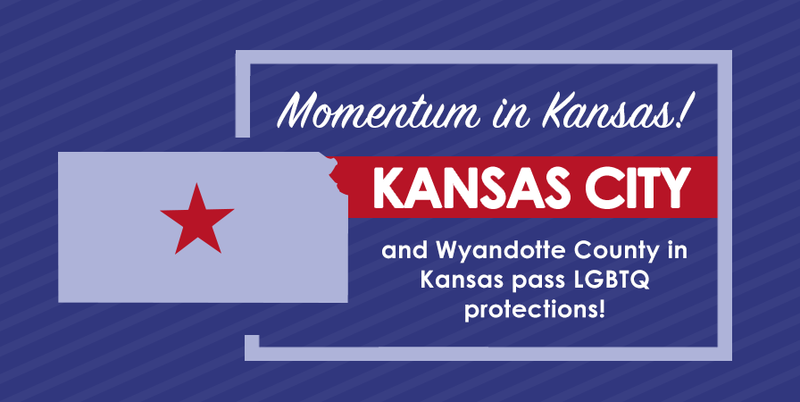 Congratulations to our partners at Equality Kansas for this significant win, and their efforts to continue working to make nondiscrimination a reality for all in the Sunflower State. To read more about the history of nondiscrimination in Kansas, visit our state page here.